Amazon Price: $49.88 (as of January 19, 2019 1:30 pm - Details). Product prices and availability are accurate as of the date/time indicated and are subject to change. Any price and availability information displayed on the Amazon site at the time of purchase will apply to the purchase of this product. Now you can share the love of Lion King with your children in a fresh new way. 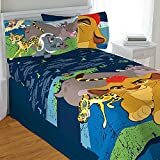 Featuring Kion and all of his friends from the lion guard, your child is sure to love this bedding set. … CONTENTS: One twin/full comforter measuring approximately 72 x 86 inches (183 x 218 cm). ; One twin flat bed sheet, finished size 66 x 96 inches (168 x 244 cm). ; One twin fitted sheet. Both of the above fit a standard twin mattress of 39 x 75 inches (99 x 191 cm). ; One standard pillowcase, finished size 20 x 30 inches (51 x 76 cm) to fit a 20 x 26 inch (51 x 66 cm) pillow.